This is the worst casino and sportsbook site ever. He stole my winnings from me. They do not have money to pay players who make a profit. It's a deposit-only site, and never makes payments from those who need to withdraw. I would not recommend this site to anyone. Anyone who registers an account and places money on this site will only be able to lose. They are dishonest and use hidden and obscure terms and conditions to steal your money. Look for another site to play, a site that is honest. 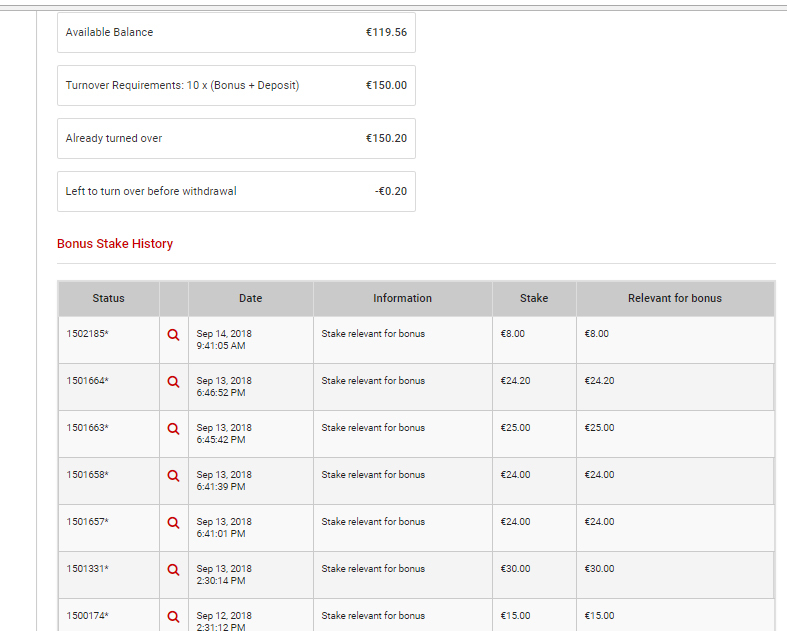 Never create an account or put money in Tipbet, or you will lose everything and you will have many headaches for this. It's an absurd. They claim that the user would need to make the 100.00 withdrawal as soon as he rolled the rollover. Wait to receive the withdrawal. And re-deposit the 100.00 to continue playing. However, this does not follow an honest logic, this does not exist in any site. The user must withdraw a value, by obligation, having to stop playing on the site while waiting 1, 2 or 3 days to receive, and then re-deposit that. This is unacceptable. On the contrary, I liked the site and decided to continue playing on it, including depositing and making thousands of other bets, participating in new promotions! Last edited by Samuel; 02-11-2019, 04:34 PM. Tipbet is a scam company. They haven't money for to pay customers! must to remove only 19,56 and not 464! Hi Samuel we want to help you...please fill out this complaint form and we will look into this for you. The site would pay 100.00 as correction, what was the initial bonus winnings? Of course not! The situation is the same, but the reverse! When you first submitted this complaint in September 2018 we contacted Tipbet and they refused to discuss the matter with us but claimed it had been resolved as they had spoken with you and explained that the terms of the bonus you took required a withdrawal be processed to terminate it at a max balance of $100. If the user completes the rollover, having a balance of 100.00, and continues playing, until losing everything, stay with 0.00. Will the site ignore all of this loss and return the 100.00 to the user account? If you ignore the gains made after 100.00, would you ignore losses after 100.00? Obviously not, do you agree? This proves that this site is scam and dishonest, which dishonors the customer just not to pay. I was stolen at 462.00 and did not report this site to anyone. Every day I will report on this scam company on all review sites, blogs and social networks, to alert other potential future players of this thief site so no one else has a headache when just wanted to play and have fun. They can steal my 462.00, but they will have much more damage because of this, losing customers and profits that would come from these. This is little to those who are dishonest and writes incomplete terms and conditions to deceive honest users and not pay. Tipbet is scam! 3. This promotion is only available to new customers who register from 02.03.2018. 4. This promotion is only for residents from countries where participation is legal and legal. 5. The bonus amount will be credited to the user account after entering the code bonus in the section Offers under Account Summary. 6. The bonus is only available for the sports betting area. 7. If another bonus code has been used previously, this bonus will no longer be available. 8. The maximum profit that can be made with the bonus is 100 €. 9. Only combination bets with two (2) or more games and odds of the respective games, each amounting to at least 1.80, are relevant for meeting the terms and conditions of this bonus. 10. Any amounts can not be transferred to another Tipbet product wallet if the wagering requirements for the bonus have not been fully met or completed. 11. By activating this free bonus all wagers will be deducted from the bonus balance. 12. Bets with odds below 1.80 do not contribute to the fulfillment of the bonus terms and conditions. 13. The bonus can not be combined with other bonus codes. 14. The bonus must be implemented within 48 hours. 15. The maximum bet of each bet is one hundred percent (100%) of the bonus amount. Only bets that are lower or corresponding to the maximum bet will be counted towards the calculation of the required minimum bet. 16. System or reusable bets are irrelevant to meeting the minimum wagering requirements for the bonus. 17. Only one betting selection per sports event / game is relevant to the minimum sales condition. If two or more bets are placed on different exits of the same sporting event, then only the use of the first placed bet slip is relevant to the minimum turnover. 18. The progress of the bonus or the terms of sales can be viewed in the user account. You can only request withdrawal account amounts that are not blocked. 19. If the user receives a Welcome Bonus for the first deposit, a payout will only be possible after fulfillment of the Terms of Sale according to the Terms and Conditions of the Bonus. 20. Any attempt or execution of any User, whether successful or not, to use an arbitrage model or any other pattern and methodology that guarantees a prize, shall be deemed abuse and shall be assessed in accordance with Tipbet's Terms and Conditions. 21. If any of these conditions are not met, Tipbet reserves the right to withhold or remove the "Spring Awakening at Tipbet" casino promotion and any winnings earned with the bonus. 22. The bonus is limited to an account, person, family, household or computer. If you suspect that you have multiple accounts, Tipbet reserves the right to remove any bonuses and winnings. 23. Tipbet reserves the right to make any changes to the terms and conditions of any action at its sole discretion or to withdraw the promotion without prior notice. It is up to the user to inform himself about the latest version, which can be found on the website. 24. In addition to the terms and conditions set forth herein, the General Bonus Terms and Conditions and Tipbet's Terms & Conditions apply. 25. The terms and conditions of this bonus promotion have been written in English. In case of a dispute regarding a translation, only the English version is relevant for the clarification of interpretation questions. "7. If another bonus code has been used previously, this bonus will no longer be available." I did not fail this rule. "8. The maximum profit that can be made with the bonus is € 100." And again, under the terms does not quote the obligation to stop playing, withdraw the 100.00, expect to receive for days or weeks, and return to play. "10. Any amounts can not be transferred to another Tipbet product wallet if the wagering requirements for the bonus have not been fully met or completed." One more sign that the person is not required to withdraw the value immediately after the rollover made. At the moment this term informs that the person can only transfer the balance to another section of the site, to Play in another section, such as a casino for example, is proving that the person can continue playing with that balance, which is now no longer a bonus and it turned out to be real money when the rollover was met. This is obvious! "13. The bonus can not be combined with other bonus codes." "Any amounts can not be transferred to another Tipbet product wallet if the wagering requirements for the bonus have not been fully met or completed." Would I now have the right to have my case exposed in the complaints DISPUTES AGAINST TIPBET section of BMR complaints here? This term breaks whatever argument you or Tipbet might say. Clearly, it is evidence that, after rollover requirements were completed, the person could use the value in other things, without withdrawing, making deposits, participating in other future promotions etc. Hi,Samuel.The bonus is a poisoned chalice.Mistake to go anywhere near it.Too many tricky terms and conditions.I agree that once you've fulfilled those conditions,it should stop - only it doesn't,it continues to hurt you ! Totally unfair. N.B. Rule 24 may be important - what do the general bonus terms and conditions say ? Last edited by quincunx; 02-10-2019, 09:57 AM.